Gateway Center: Classrooms; Registration office located at windows facing Hardy Avenue. Extended Studies Center: Osher Institute at SDSU office and classrooms. Lot 6: Parking permit valid on all levels. (Levels 5 and 6 are closest to Gateway and Extended Studies Center classrooms.) Handicapped- accessible and motorcycle spaces available. Lot 7: Overflow parking is available in “SP800” spaces with an Osher parking permit. Student Services West (room 2620): SDSUcard office. Lot 3: Overflow parking is available in “Student” spaces with a CES parking permit. Lot 4: Overflow parking is available in “Student” spaces with a CES parking permit. Parking for Osher courses is conveniently located, and is included with your course enrollment. After completing registration for a course or event, you will receive a parking permit by email which is also your registration confirmation; it must be printed in color and displayed face-up on your dashboard. Parking permits are required 24 hours a day, 7 days a week, and are valid beginning one hour prior to your class, and ending one hour after your class. 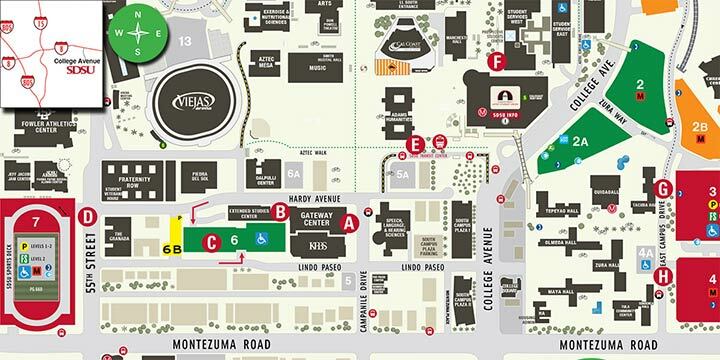 Your confirmation/parking permit is valid in Parking Structure 6 (formerly 2), adjacent to the Extended Studies/Gateway Center classrooms (levels 5 and 6 are closest to the classrooms held in ESC and Gateway Center). Handicapped parking is available. A parking permit is still required, in addition to a disabled placard, disabled plate, or a temporary H/C (handicapped) placard issued by the DMV. Visitor parking is available in Lot 6B. Permits are $3/hour. Motorcycles must park in motorcycle stalls only. Please clearly display your parking permit each time you come to class, and check that dates are valid. Be sure the permit is printed in color, with the time(s) and date(s) of your course(s) facing up when you place the permit on your dashboard. Legal parking is the responsibility of the individual. For questions on parking permits or citations, contact Parking Services. at (619) 594-6671. Park & Ride lots are available throughout San Diego County. Visit icommutesd.com for more information. On the Go Rides & Smiles® program is the largest volunteer-based transportation service in San Diego County available for adults age 60+. For details about discounted On the Go transportation services or to learn about volunteering visit jfssd.org/onthego or call (858) 637-7320. Take the trolley or bus to your Osher class. They stop close to our classrooms. Call the Metropolitan Transit System at (619) 233-3004 or go to sdmts.com for more information. The SDSU Transit Center has become a popular transportation method for many Osher Members, with bus and trolley access conveniently located on campus. Discount rates available from MTS for senior/disabled/ Medicare recipient riders.